Australia’s Pork CRC (Pork Cooperative Research Centre) will be launching a new high-yield, disease-resistant field pea variety for commercial sowing next year. Previously designated PRL131, the new variety CRC Walana offers pork producers a reliable protein source. Pork CRC has applied for Plant Breeders Rights for CRC Walana in Australia and has licensed Waratah Seed Company Ltd to market the new variety. CRC Walana has offered better yield performance than Yarrum and Maki, varieties recently released by The University of Sydney field pea breeding program and Plant Research New Zealand Ltd (PRNZL). 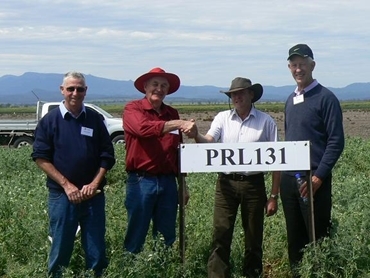 Extensive field trials were carried out in northern NSW and south east Queensland on the pea varieties. The original cross was by Adrian Russell of PRNZL and subsequently selected for release by Steve Moore, University of Sydney with funding from the Pork CRC, which supports the New Zealand and Narrabri, NSW-based field pea programs as part of its innovative and successful feed grain breeding program. The Maki variety was released by the Pork CRC program successfully in 2009. Dr King said the program enhanced the commercial production of cereals and pulses with high yield, cost-effective agronomy and acceptable nutritional attributes for pigs. Dr King concluded by saying that Pork CRC is committed to identifying high yielding field pea varieties for northern and southern regions, and encourages farmers to grow them for the Australian pork industry in these regions.